Just a quick note about Kickstarter and the Pebble watch. Given everything out there about Kickstarter’s founding story one gets the impression that the crux of its existence revolves around art and creativity. Just a guess based on that huge banner on their home page. Funding a rock concert in New Orleans and all that. Novellas, art projects, letters, albums, tours, Girl Walk, etc. Up for debate whether consumer electronics fits in this category. Ask someone in 2006 and the answer is likely “HELL TO THE NO”, especially in the years before Apple (and their design-conquers-all attitude) was the most respected brand in the world of consumer electronics, which pre-iPhone they def. were not. 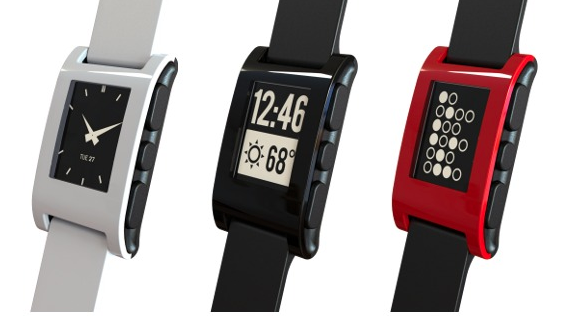 Back to the Pebble watch. Consumer electronics are among the most well-funded projects on Kickstarter despite the fact that it’s dubious whether they should even be included in the scope of fundable projects. Which is really fascinating because that to me means that consumer electronics as a market has been ripe for disruption all along. That said, it’s ridiculously not obvious that disruption would come from the same place that allows an artist with a sharpie, a hotel room and a webcam a way to make the art she wants. I guess the big lesson here is that you can have a secret plan to disrupt one market (how creativity is funded) and end up making an arguably even larger splash in another one (consumer electronics r&d, marketing, sales, business models, etc.) Was this part of Kickstarter’s plan all along? Obviously there’s no way to tell, but my guess is probably not. Making consumer electronics has, as far as I can tell, not *really* been considered a creative way to spend your time until maybe right now. In 2009 I did a ton of research on making a totally awesome mini-projector (thesis: smart phones would soon be everywhere, and the only downside is the lack of screen real estate). I was basically told over and over again that I would get undercut by someone doing it cheaper who already has a standing deal with Best Buy, would get shoved out of the market, and go bankrupt doing so because of the overhead that accompanies “hardware startups”. So good on you kind citizens of the internet for saying eff that. Give us devices that are smart and beautiful and carefully crafted and we will throw literally millions at them overnight. The funding of consumer products is very interesting because people are using them like a pre-order, and don't think that they are funding a creative project. Which leaves (often) inexperienced and young teams under a lot of pressure to make a great product that works. There could be some very public failures in the future. The Coffee Julies was a minor one. Yeah I remember reading Salmon's take and have followed along as some of the more product-oriented projects have failed to meet expectations/promises. Though I do think that now Kickstarter will likely create some sort of best-practices or how-to type documentation for product/shipping-based projects to hopefully alleviate some of the mistakes that come from over-promising and under-delivering. In a seed marketplace that penalizes hardware startups/concepts (as you astutely describe), this is probably one of the few ways to get a good hardware concept off the ground. Hopefully others with hardware ideas will take this as a kick in the pants and follow the same path (and hopefully kickstarter and others like it will only be happy to help them). I just wish that Kickstarter was more transparent about what projects they will and won't accept. I know people who have had their apps rejected because, *officially*, Kickstarter does not do 'start up funding' or 'seed funding', which is exactly what most of these consumer products are doing. Basically, Kickstarter is playing favorites, or choosing things that they think will get them a commission, which is certainly their prerogative. It irks me, though. Love the platform, hate the 2-faced message. Amanda, you nailed it on the head. Kickstarter is disrupting nearly every industry it touches. In my discussions with members of the Kickstarter team, it is clear that they had no idea that was what was coming. But now, everywhere we look, Kickstarter is kicking over the established gatekeepers of anything that has a following. On my podcast, Funding the Dream on Kickstarter, I recently spoke with Brian Fargo, project owner of Wasteland 2, a computer game that has crossed the $2 million mark on Kickstarter. It becomes clear in the discussion that connecting the creative person with the consumer of the creativity is bypassing traditional publishers who traditional acted like a gatekeeper to the market. As you have pointed out, Kickstarter is disrupting because it is allowing individuals to directly fund a designer without an established company in the middle. Kickstarter is usually pretty clear with why they turn down a project. While it is true the these companies appear to be getting seed funding, according to the guidelines for Kickstarter, the funds are going to the production of the item and not to the operations of running a business. Kickstarter funds projects with a finite end date (i.e. a project not a company). That is why some products make it through, while others that aim to help redesign a website or hire an engineer don't get approved. Came here to say that your website seriously needs some white space on the left side. Even 2 pixels, please. noted! you must be pretty zoomed in because on my screen there's at least 100px of white space on the left side. but just for u, tomorrow i will add 5px of padding on the left side. leave any other requests in the comments, please. This is very much in the same vein of what I have been saying, which is crowdfunding as a business model disruption engine. Kickstarter, Indiegogo, and the myriad of other platforms are facilitating that experimentation. While much of the projects have been heavily oriented towards creative works, there is little reason that it could not enter other industries and sectors. And what the Kickstarters, et al. do not allow, other platforms will come up to support those projects. Kickstarter finances initiatives that has a limited conclude time frame (when i. age. some sort of challenge an excellent corporation). That's why many merchandise allow it to become as a result of, while other people of which seek to guide modernize an internet site . or maybe seek the services of a electrical engineer do not get okayed.